Time to buy a big beautiful pumpkin and a few cans of pureed pumpkin to make pie. Wait? Did I say pie? I must have slipped up because I meant chili. Pumpkin is a great addition to chili. It’s cheap, easy, and has 763% of your daily value of vitamin A in one cup (and only 83 calories). You can sneak a bunch of nutrition into food by adding pumpkin. This chili recipe below is the healthiest chili (with meat) that I have ever made. It boasts 28% of your daily value of iron, 45% of your daily value of vitamin C, and 293% of your daily value of vitamin A per serving. This is like a nutritional "rock star" chili. I used ground turkey breast because it is low in saturated fat and beans, corn, and tomatoes to up the vegetable content. What do you think? Did you try pumpkin chili? I can't imagine pumpkin in chili, but I'm going to give this a try. I'll be interested in comments from readers who also try it. Pumpkin is so nutritious that it will be good to have a savory recipe using it. If I wanted to cook this in the crockpot, would I just put all of these ingredients in the slow cooker for about 4-6 hours? Thanks for this recipe! 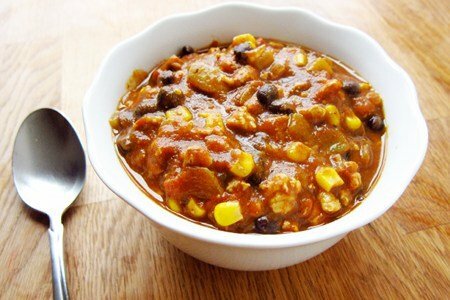 I love adding pumpkin to recipes and this looks like a very easy and good Chili. What would I do without your fabulous recipes? Thanks Snack Girl! The serving size is one cup (8 ounces). I will fix the recipe to reflect that. Thanks for the question! Thanks for solving the "what's for dinner problem"! I have all the ingredients but substituting venison for the turkey. I have pumpkin from the garden how would you prepare it instead of using canned pumpkin, in a recipe ? The recipe here is very similar to my enchilada sauce. Cocoa adds a delicious bottom note to Mexican mole, enchilada and chili. I would use chopped sweet potatoes and a bit of agave to balance the other flavors. I use winter squash also in chili. It works very well added to my vegetable beef barley soup. Lends a depth of flavor and very few calories. Soooo good! I have made your chili - it is great and has inspired me to add pumpkin to other soups/stews as well! Thanks for the reminder. Loved watching you online - so much fun to put a voice to the name and face. Keep up the good work, Lisa! First time comment, long time fan. Have not used pumpkin puree in chili before, I am going to give it a try and perhaps add some mushrooms to the onion for a little fake beef-y-ness. (psst, typo at the bottom "10 minutes and seve"). Thank you Lisa for the great recipes! Hi, do you think this freezes well? I'm trying to cook some recipes in bulk to eat after I have my baby in January. Thanks!